Classic sound and transparency that works pretty much with any amp and guitar you hook this into. The design is somewhat outdated, especially eq control. 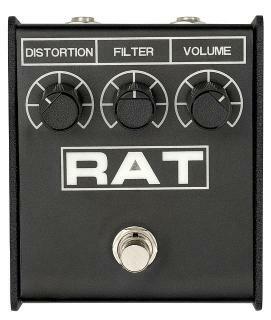 The Rat is very simple in design - a sturdy black metal box, with 1/4 input and output sockets, a control for "Distortion", "Filter" and "Volume". It has one full bypass on/off switch and a LED that shows when the unit is engaged. It can be powered via a 9 volt battery or a power supply (not included). This pedal is simplicity itself. The distortion control dials in the amount of dirt, "Filter" acts as an eq control in reverse, where the more you go towards the right the sound smooths out more. The "Volume" control lets you dial in the desired amount of volume. The big surprise to me was that the unit sounded at ease with any amp that it was plugged into. While I wouldn't call this a distortion box, but more of a overdrive/fuzz box, the unit definitely could cook up some very well rounded saturated lead sounds. I found this unit sounded the best when the "Distortion" was between 9 and 2 o'clock positions. On those settings it provided a very well rounded semi distorted blues and rock sounds. By moving the "Filter" to the right past 12 o'clock it produced some capable chunky sounds, and easing off on the dial of the "Filter" control towards 9 o'clock gets you some very nice crunch rhythm tones. This unit could also provide nice lead boosts and a little dirt for a blues solo and it is probably most capable for slightly overdriven or mild distortion sounds. When the distortion dial is all the way to the max the Rat gets muddy and fuzzy, probably close to sounds found on some Smashing Pumpkins or Nirvana leads. I wouldn't use this pedal for my main distortion as it gets too muddy at high settings. Probably the best placement for the Rat would be for blues or rock players that need a little extra crunch or a smoother lead tone. Some milder settings between 9 and 3 o'clock could be blended with a crunch channel (think AC/DC settings) on a tube amp to create a nice dense metal sound. The volume could also add an extra push on a tube amp's preamp input to force it to overdrive more, which would be my guess as to what Metallica did on their early recordings. The darker sound of teh RAT with the brighter punchier sound of an overdriven Marshall could work rather well. I feel that although a very capable unit, especially due to its transparent sound, the Rat definitely shows its age and could use some fine tuning, especially in the eq section. On the other hand, it offers some interesting sound and it could be blended with pretty much anything.